The Grace Dodge Hotel in Washington DC was created to become a haven for women workers during World War I. Although the construction of the seven story building was not completed until after the war, in 1921, the hotel was a strongly woman-only space, even if for only a brief part of its history. Nevertheless, it is no surprise that Margaret Sanger chose to stay here overnight on January 3, 1926. 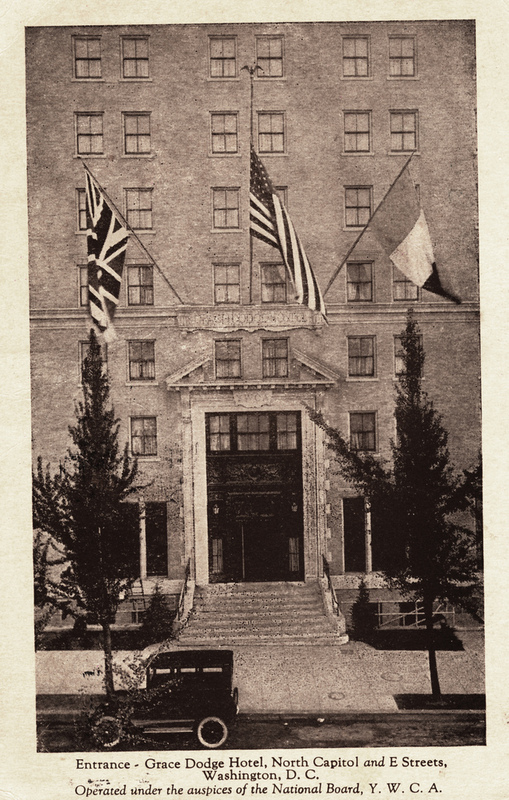 The Grace Dodge Hotel has an interesting and unique history rooted deeply in women and politics. The owner of the hotel, Grace Hoadley Dodge, was a wealthy philanthropist and president of the YWCA. In fact, the hotel was run by the YWCA for many years. Dodge committed much of her time and money toward helping employed women. It follows that the hotel, located at North Capitol and E Streets, NW, was targeted toward business women, workers, and tourists. It also accommodated mothers traveling with their young children, offering suites with cribs and “sanitary appliances for heating the milk bottle in a hurry”. In honor of the grand opening of the hotel, Grace Coolidge, wife of president Calvin Coolidge, visited the Grace Dodge Hotel in October 1921. While there, she remarked on its special ability for holding women’s conventions and its homey atmosphere. The Washington Post commented further that even the layout of the hotel supported strong female discourse,“There’s a parlor on every bedroom floor, where women may hold conclaves undisturbed by any blundering male, for men are absolutely taboo above the street floor”. The price to stay at the Grace Dodge Hotel ranged from $1.50 to $4.00 per night in 1921, which with inflation is about $20 to $53 today. The Grace Dodge held some historically unusual and progressive rules. The staff was originally exclusively women. Tips were strictly against the hotel’s policies since the staff was paid a fair wage and did not board or take free meals. There was also a ban on the sale of tobacco products in the hotel. By the time Margaret Sanger stayed here, the Grace Dodge had already been accepting male guests for nearly two years. 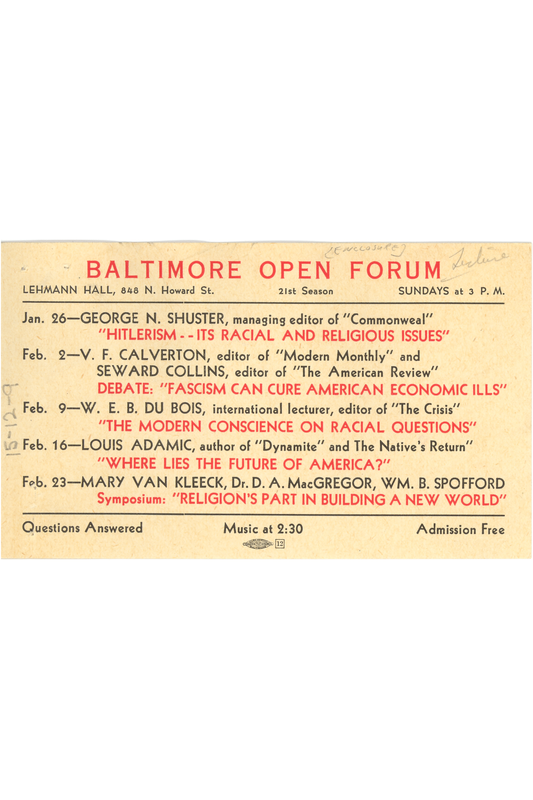 While she was in DC, Sanger gave a speech at the Baltimore Open Forum, a weekly open forum on topics related to politics, art, and current issues that boasted many other prominent speakers, including W.E.B. Du Bois. During her speech, Sanger argued that birth control could be a means to avert infantile deaths, and that “Birth Control does not mean no children. It means bringing into the world only such children as are wanted by healthy parents”. Although the uniquely progressive aspects of the hotel diminished with time, The Grace Dodge Hotel, later shortened to The Dodge Hotel, remained open until its demolition in 1972. To read Sanger’s full speech at the Baltimore Open Forum, click here. Click here for our map of Sanger’s travels. 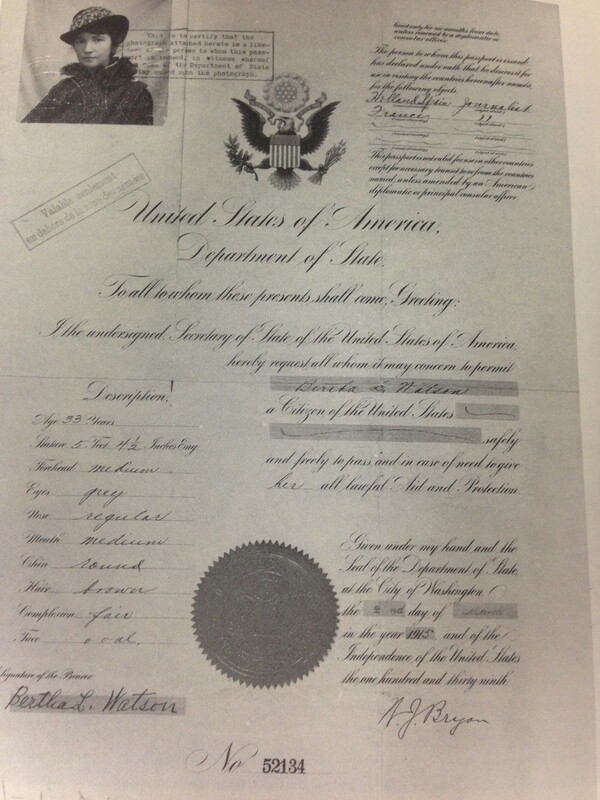 Sanger’s 1915 passport under the pseudonym “Bertha L. Watson.” It was much easier then to get a false passport! Bertha Watson, you ask? But this blog is about Margaret Sanger! Yes, of course it is – but if you were fleeing an indictment trial for attempting to mail copies of The Woman Rebel, deemed “obscene” literature, wouldn’t you sail under an alias, too? Sanger’s diary for November 3, 1914, is written on Canadian Pacific Railway Ocean Services stationery, with room to fill in the name of the ship on which she was sailing — the R.M.S. Virginian, in this case. The entry is also headed “Sailing to England as Bertha Watson.” There are entries for the first, second, and fourth days at sea, before the diary resumes on November 13 from Liverpool. The R.M.S. Virginian, run by the Allan Line, sailed from Liverpool to Quebec. She and her sister ship, the R.M.S. Victorian, were built at the Belfast shipyard of Workman, Clark, & Co. in 1904, and were the first two passenger liners crossing the Atlantic to be powered by steam turbines. Her maiden voyage from Liverpool to St. John, New Brunswick, began on April 6, 1905. On subsequent voyages, she ran the Liverpool to Quebec line for which she had been built. 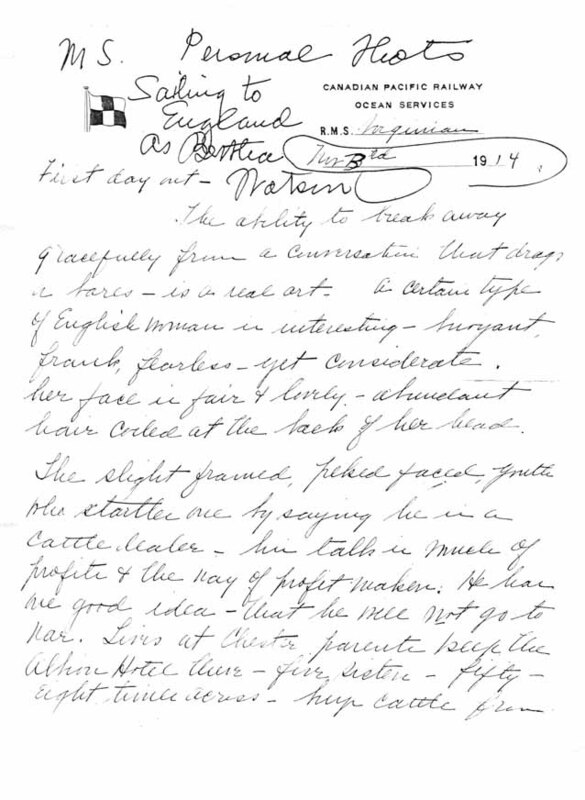 “Sailing to England as Bertha Watson” — The first page of Sanger’s shipboard diary. The ship had quite a few adventures outside the normal trans-Atlantic duty. On April 14, 1912, the New York Times reported that a wireless dispatch received by Allan Line officials in New York indicated that the Titanic had struck an iceberg and the Virginian had responded to these distress calls. The Virginian had sailed on Saturday, April 13, from Halifax, so she was too far from the Titanic to get there quickly enough to be of use and thus resumed her normal route upon hearing that the Carpathia was closer and would go to the aid of the Titanic. 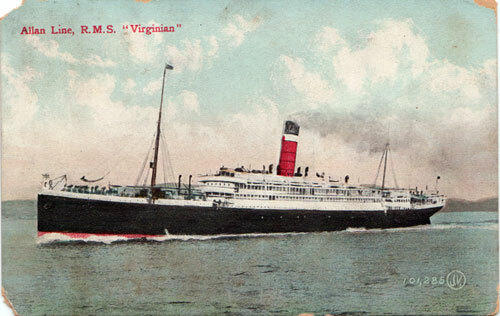 In late May, 1914, another shipping disaster affected the Virginian. On the fog-shrouded St. Lawrence River, the Canadian Pacific steamship Empress of Ireland, making a voyage from Quebec to Montreal, was struck on the starboard side by the Norwegian collier Storstad; the Empress of Ireland sank only fourteen minutes after the collision, taking with it 1,012 of the 1,477 passengers and crew. This left the Canadian Pacific ocean services one ship short; the Virginian filled in. This explains the heading on Sanger’s stationery. Not long after Sanger’s voyage, the ship was taken by the British government for troop transport during World War I; following the war, she was sold to the Swedish American Line, where she was rechristened Drottningholm and began sailing in May 1920 from Göteborg to New York. During World War II, some of the Swedish American Line ships, including Drottningholm, were used by the Red Cross for the exchange of diplomats, civilians, and wounded prisoners of war. Following the war, the ship was again sold, this time to the Home Lines; again rechristened, this time as the Brasil; and again began sailing a new route, this time from Genoa to Rio de Janeiro. In the 1950s, although still owned by the Home Lines, Brasil was managed by the Hamburg-Amerika line, rechristened Homeland, and sailed first the Hamburg-Southampton-Halifax-New York route and then the Genoa-Naples-Barcelona-New York route. In 1955, she was retired and sent to the shipbreakers at Trieste to be scrapped after 50 years of service, a long and full life indeed. cargo cargo – food taken from the producers to supply the fighters. A certain type of English woman…buoyant, frank, fearless – yet considerate. Her face is fair & lovely – abundant hair coiled at the back of her head. The slight framed, peked faced, youth who startles one by saying he is a cattle dealer – his talk is much of profits & the way of profit makers. He has one good idea – that he will not go to war. Lives in Chester parents keep the Albion Hotel there – five sisters – fifty-eight times across – buys cattle from Argentine. a nice chap on board – (capitalist) – been all over – so different from the provincial Englishmen – we talked of labor & its problems – he has a view of philanthropy. arrived at the Adelphia Hotel 11am. No trouble at Customs as I had only one bag. Perhaps it’s slightly more difficult to plot the R.M.S. Virginian on our map than the usual Sanger Slept Here post, but the voyage came at a crucial point for Sanger. She was fleeing indictment and attempting to keep up as much of her work as she could while away. On a more personal note, her journals for her time in England in 1914 record how desperately she missed her children as well as the breakup of her marriage to William Sanger. The R.M.S. Virginian’s eventful life was nothing compared to Margaret Sanger’s. For more information, see the November 3, 1914 entry in MS’ diary and a rough-draft transcript of the November 3-7 entries at Editors’ Notes. For more information on the Virginian’s involvement in the Titanic disaster, see “Allan Liner Virginian Now Speeding Toward the Big Ship,” New York Times, 14 April 1914. For the Empress of Ireland disaster, see the PBS Online page about it. Margaret Sanger took numerous trips to England for both political refuge and research; however, her visit to the Easton Glebe estate was a memorable trip which would mark the start of a great love affair and lifelong friendship. In 1920, she had the pleasure of receiving an invitation from H.G. Wells to visit his house in Essex, England at the Easton Glebe Estate. She stayed overnight on July 24, 1920. At this time H.G. Wells was a prominent writer, free thinker, social theorist, who was a supporter of neo-Malthusian, eugenics, and most importantly, Margaret Sanger. 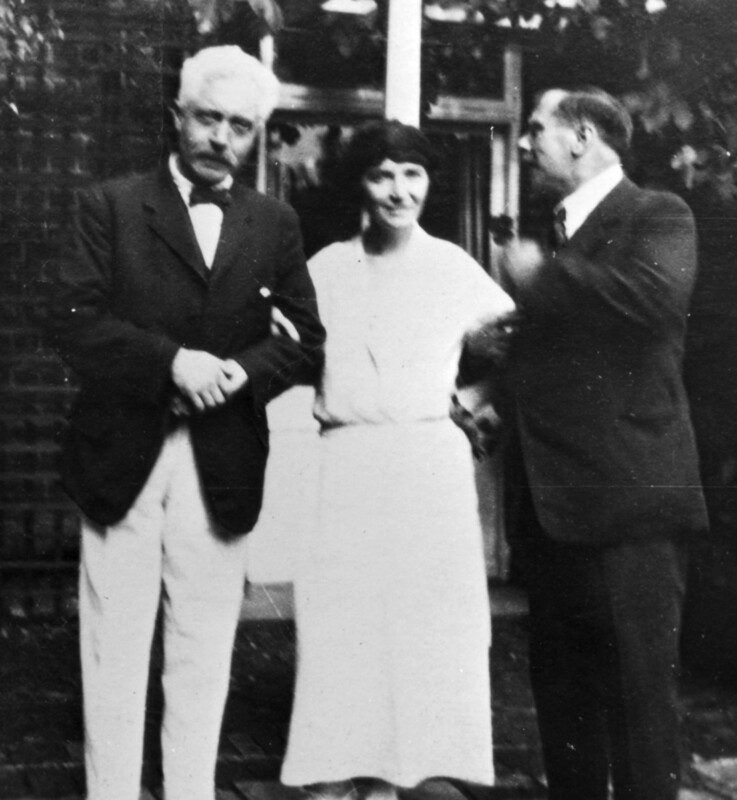 Sanger with H. G. Wells and Otis Skinner. She met Wells on her 1920 trip to England, though this picture might have been taken at a later date. (Courtesy of the Sophia Smith Collection, Smith College). In Wells’ A Modern Utopia, we can see many similarities between his and Sanger’s ideals. He, like Sanger, also discussed that those that were economically or mentally unstable should not reproduce, because they were essentially unfit to raise children. In 1916, before he and Sanger met, Wells sent a letter of protest to President Wilson against Sanger’s federal indictment for the distribution of the Woman Rebel. The Woman Rebel was a publication that provided birth control knowledge for women, which was seen as obscene material and a violation of the Comstock law. Sanger and Wells were both influential, intellectual free thinkers, who held similar interests and ideals. It is no wonder that when they were finally able to meet in 1920, sparks flew. Along with sharing all these qualities, they loved each other’s company. Her visit to the Easton Glebe Estate has truly made history for both their friendship and the birth control movement. By getting to know each other on a more personal and intellectual level, Wells continued to help and support her cause. H.G. Wells house, leased from Countess Warwick during the first world war. This estate was the centerpiece for his novel “Mr. Britling Sees it Through,” in which he discussed his wonderful life at the Easton Glebe Estate and war time anxieties. When Sanger arrived for her first visit, Wells awaited her arrival at the Dunmow Station from which they drove a little car to an “old stone, ivy-covered; lovely lawns were spread around it.” In Margaret Sanger’s autobiography, she described her stay here as a lovely, magical weekend, where she got to know Wells as a person who was amusing, witty, and flirtatious. Among her numerous visits she went on walks in the Easton Glebe estate’s beautiful gardens, the surrounding woods, or around the lakes and streams. Wells as well had a love for this estate, which was the centerpiece of his novel, “Mr Britling Sees it Through.” In this novel he discussed a wonderful life in tranquil Essex, a life which Mr. Britling, the main character, wished would never change. For both Sanger and Wells, this estate was a wonderful place to stay and develop intellectually. One can imagine how Sanger felt arriving to a place where everything was charming, where people shared similar views, a place where laughs and happiness were plentiful. Sanger stated, “From 1920 on I never went to England without spending part of the time with H.G., and many of the most attractive people I met were in Easton Glebe.” Their connection and similarities were so profound that it almost seems natural that they would make a strong connection and become strong supporters of one other and lifelong friends. Her descriptions of her stay here can make it appealing to anyone! Who would not want to enjoy a weekend in England at an enchanted-like estate filled with love, intellectuals, and overall, beauty. In the summer of 1932, Margaret Sanger took a “cure” for her weakness and severe fatigue. Part of this “cure” would take place when she stayed in the Goethe Haus in Marienbad, Czechoslovakia. 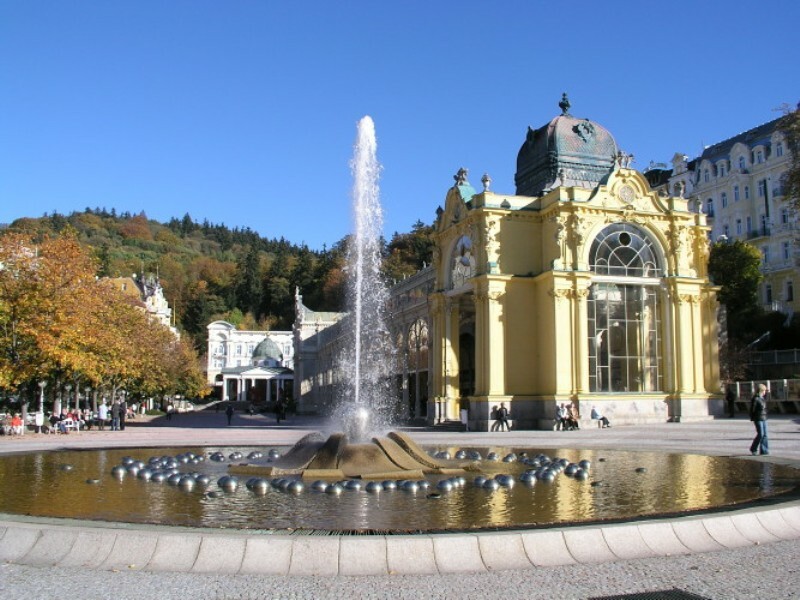 Marienbad is a spa town located in the Northwest of Czechoslovakia (now the Czech Republic). The town is known for having over a hundred mineral springs which were known as cures for various ailments. It was the restorative waters of these springs that Margaret Sanger sought. In a letter written to Havelock Ellis on July 16th, Sanger begins by excitedly describing the room in which she is staying. 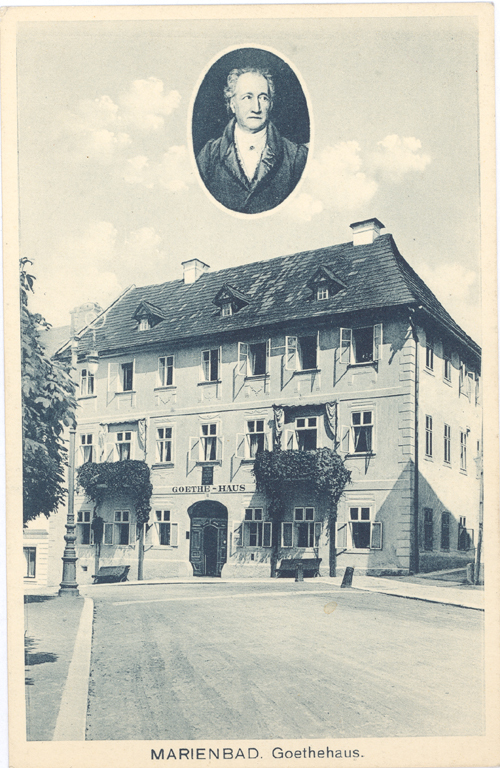 Postcard with image of the Goethe Haus in Marienbad, Czechoslovakia. She goes on to describe how her doctor, Dr. Max Porges, believed that she was too weak to begin “curing” in the baths and therefore, she resorted to resting. Porges believed that Sanger suffered from liver trouble and glandular disturbance. His treatment included various injections into Sanger’s liver and ovaries, a mud pack to hold on her liver, daily exercise and a special diet. The letter continues with Sanger’s always blunt commentary on the other visitors to the baths. Other well-known visitors to Marienbad include Mark Twain and Alfred Nobel. Esther Katz, Cathy Moran Hajo, and Peter C. Engelman, eds. The Selected Papers of Margaret Sanger: Birth Control Comes of Age, 1928-1939 Vol 2. Urbana & Chicago: University of Illinois Press, 2006, 197. MS to Grant Sanger, July 19, 1932, and MS to Slee, July 15 and 18, 1932. Esther Katz, Cathy Moran Hajo, and Peter C. Engelman, eds. The Selected Papers of Margaret Sanger Birth Control Comes of Age, 1928-1939 Vol 2. Urbana & Chicago: University of Illinois Press, 2006, 197. From July 7th to the 21st of 1937, Margaret Sanger made a visit to Santa Fe, New Mexico. Well, her five-day travels had her resting in the Bishop’s Lodge Inn, known today as the Bishop’s Lodge Resort and Spa. The resort is located in the Tesuque Valley of New Mexico and surrounded by the Sangre de Cristo Mountains. One look at this photo of the mountains makes me understand. 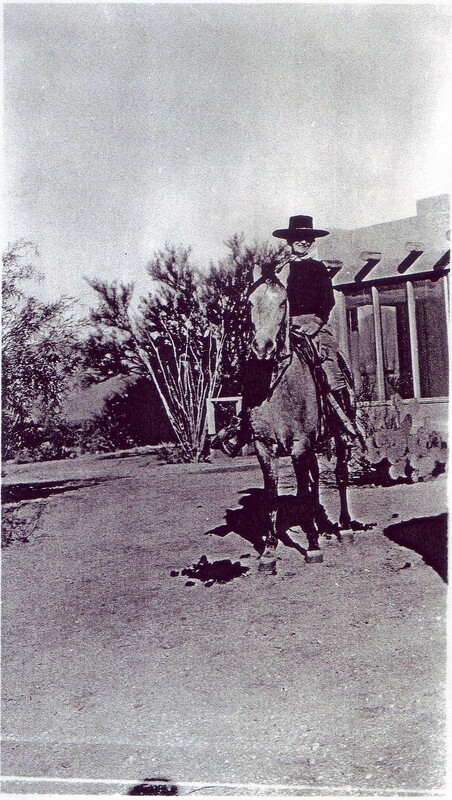 Sanger was vacationing in Santa Fe to experience that beautiful landscape! I mean seriously, it looks like a setting pulled out of Middle Earth. I can totally imagine Mithrandir and Pippin riding from Rohan to Gondor. Okay, there was another more legitimate reason for Sanger to travel to Santa Fe. Yes, it had to do with the birth control movement and no, it didn’t have to do with experiencing J.R.R. Tolkien’s masterpiece. My research took me to the Santa Fe Maternal Health Center. The SFMHC opened on October 27, 1937. MS in the 1940’s (Sophia Smith Collection, Smith College). Who encouraged the founders to go through with their plans to build a center? None other than Margaret Sanger. Earlier that summer, Sanger met with prominent women from Santa Fe to discuss the importance of birth control. Throughout the late 1930’s, Santa Fe was still suffering the hardship of the Great Depression. New Mexico ranked the fifth-highest in the nation for infant and maternal deaths. One of the reasons that mortality was so high was the inadequate provision of health care. But even where there were health facilities, the Catholic Church owned most of them. It refused to use its clinics for contraceptive education or provision. If the women of Santa Fe wanted to make birth control available, they would need to do it themselves. The SFMHC was created to provide better child and maternal health care while also distributing birth control. Now, the second part of this was more difficult. At this time a majority of the New Mexico population was Catholic. 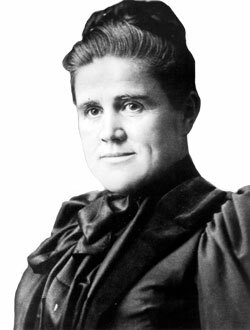 Even more importantly, Florence Davenport, one of the women who had invited Sanger to Santa Fe in the first place, reported that “8 out of 9 members of the City Council are Catholic.” With such a significant Catholic population among the city’s leaders, getting the clinic open would not be easy. However, those that managed the clinic attempted to get around this issue. Children at the Santa Fe Maternal Health Center. They recognized that the women of Santa Fe, and of New Mexico, not only needed access to birth control, but also to other medical services. 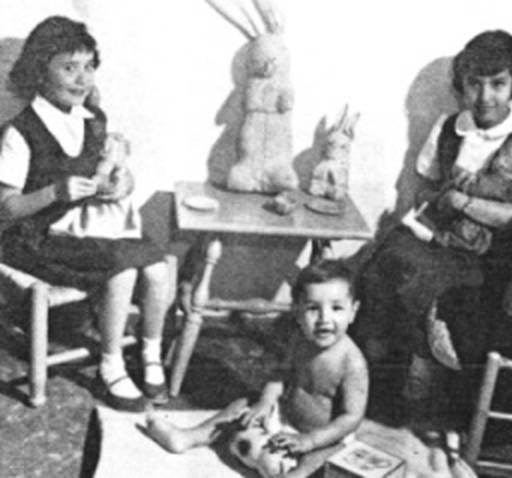 This meant that their operation would not only include birth control, but also pre-natal, post-natal and infant care. Six months after the clinic opened in 1937, Cecil Damon, Sanger’s secretary at the Birth Control Clinical Research Bureau, contacted Davenport. Damon wrote that Sanger planned to cancel funding to the SFMHC explaining that sponsors felt that the funds being sent to the SFMHC were being used for other services other than the provision of birth control. Though the sponsors supported the provision of general medical services to poor women and children, they felt as if finding sponsors for such causes was much less difficult than finding sponsors to support the provision of birth control. The sponsors felt that all their funds should be focused on providing access to contraceptives. Davenport responded by stressing the Catholic authorities in New Mexico. She would reiterate that the “State, County and City Health officials [could] not help [them] as long as [they] have affiliations with Birth Control Group.” In the end, Sanger did stop funding the SFMHC. But this didn’t hinder the service of the Center, which continuing providing health and contraceptive services to women and children in New Mexico. Eventually the Center would expand its services to include eye, teeth, circumcision and operative diagnosis clinics. These services even included providing poor families with food, clothing and work for the patients’ husbands. So maybe Sanger might not have spent her whole visit in Santa Fe horseback riding and cooking out by a BBQ pit. More likely she was there, meeting with women, like Davenport, ensuring the establishment of the Santa Fe Maternal Health Center in order to provide access to contraceptives to the women of New Mexico. Sullivan, Michael A, “Opening of the Santa Fe Maternal Health Clinic, 1937,” New Mexico Office of the State Historian, http://www.newmexicohistory.org/filedetails.php?fileID=455, Accessed July 2, 2013. Santa Fe Maternal and Child Health Center Papers, Center for Southwest Research, General Library, University of New Mexico.